We were also continuing to get news that law-enforcement agencies (Police departments, FBI and CIA) as well as the military, were being trained that Islam and Muslims pose the greatest threat to the US because we are determined to destroy the US; the brainwashing of our protectors is well underway. The overall impression is inescapable; we are not simply paranoid, they are actually out to get us. What to do? We tried reaching out to our persecutors and their bosses, but got nothing. We tried to reach out to our lawmakers, the Senators and the Representatives, but once again, when faced with supporting the right cause and being called “soft on terrorism” or, standing patriotically “tough!”, Muslims lost out. 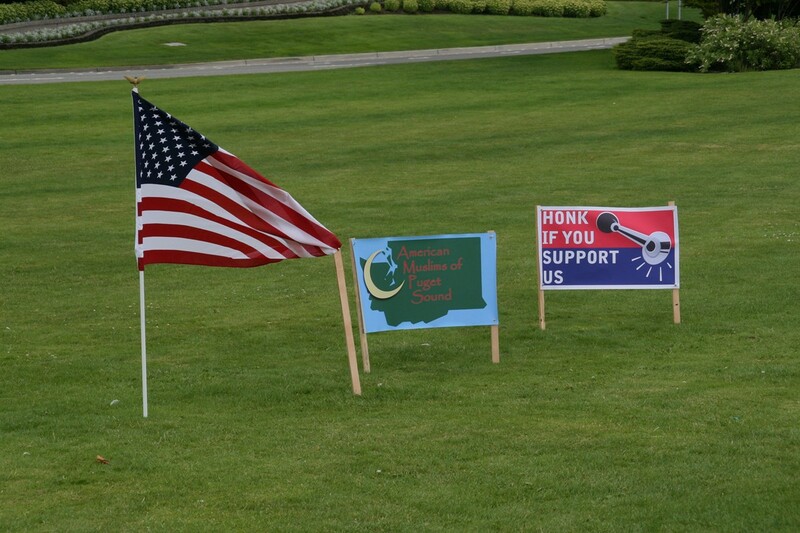 In May, we started exploring the possibility of conducting a vigil-demonstration on the US-side of the Peace Arch border-crossing at Blaine, WA. We started with publicizing within the Muslim communities and to non-Muslim friends, to join us and make this a success. We got the support of Kamran, fellow Muslim and owner of Digi-Copy printers who gave us expert design advice and a HUGE discount for our banners (we wanted everything to be first-class) and even then, the cost of printing the banners came to almost $900. The publicity began; I was determined to hold the demonstration even if I went alone. One of the problems I was faced with, was the fact that most Muslims I heard from, were rather apprehensive of participating in a demonstration right in front of the Customs and Immigration entry-point. I continued to hope that Muslims will overcome their reluctance to be seen and will show up. In June, we got the permit to hold a demonstration at the Peace Arch. By this time, we had about a dozen people saying they would join with some family members…not as good as I would have liked, but a workable start. July 17 was a cool, slightly drizzly day as I drove to the Lynnwood Park and Ride for the general rendezvous. By departure time (10:00 a.m.) we were three people strong. We proceeded to Blaine Peace Arch Park, we were met by Ranger Snow who was very pleasant. He gave us some information and told us he was there to help if we needed it. Earlier, we had asked him to be prepared in case there were any counter-demonstrations (there weren’t) and so he had passed the information to Blaine Police who were ready to help us if we needed any help. We set up the banners and the place looked GOOD!! Traffic was light both ways, but everyone had a good look at our banners, there were even some who honked in support, gave us the thumbs-up. We did notice that the honks were very short, almost as if the drivers did not wish to be identified by anyone else. One full van drove towards the US check-point and someone yelled, “Hey! We are Muslim!” as they waved wildly. We had two TV stations and one radio station (including CBC, a Canadian station) interview us while we were there. Earlier another TV station had covered us at the rendezvous point, we had also been covered by a couple of newspapers and another three radio stations; publicity had been good. At 1:30 p.m. we gathered to pray under the Peace Arch, we were joined by a Priest from Bellingham (see [prayer picture). By this time, there were another three Muslims (five mujahideen in all) and 6-7 non-Muslims from Bellingham who came to join us briefly, we could see that for three of them, it must have been physically challenging to come, but they did; it was an honor and a pleasure to see such support for Muslim civil rights. We then shared the spiced fruit salad (Chaat) I had made in anticipation of about fifty people and I had brought drinks…there was a lot left over. Has anyone ever noticed the juxtaposition of the floral US flag and the traffic signs behind it, reading, “STOP”, “WRONG WAY” AND “DO NOT ENTER”? I was amused by this ironic reflection of the surly attitude of the border agents. At 4:00 p.m. we took down everything and headed home. It felt good to be doing this vigil-demonstration, a couple of people suggested we should hold such vigils every month, but I am not sure if the same people could be up to it that frequently. It would certainly be a good idea to hold these vigils if and when we can muster a higher turnout from Muslim communities because large numbers show deep concern and could start some action by our politicians. All in all, it was successful as far as getting the message out but it fell short in getting Muslim participation. However, now that we have seen that this demonstration was not dangerous, perhaps more people will feel encouraged to join us the next time. Sadly, since we are reasonable sure things at the government level aren’t likely to change soon, there WILL be a next time! In the meantime, the banners are available on loan to people who need it and who promise to treat them gently.